Pic by Michael Karrer from Flickr. The initial theme was “moon,” and some other things, but the moon idea was the most intriguing. I figured that just carving a bunch of bumpy craters would be somehow anticlimactic and just random; what would be really cool is if I could map out a section of the lunar landscape and actually carve a scale model of that around the ring. Which ups The Geek by a neat factor of 10, easy. So that’s what I did. 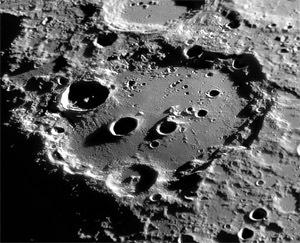 I asked if there were any favorite sections of the moon, any pet craters so to speak (don’t you have a favorite crater?) 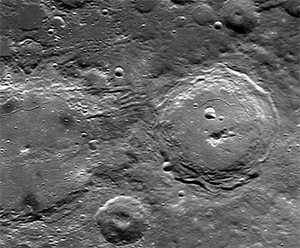 and was pointed at Tycho, the magnificent and fairly “young” crater with all the blast lines radiating out from it. It’s pretty awesome really, plus it’s rife with fictitious references. I spent a lot of time browsing Flickr images taken by various astronomy enthusiasts. Of which there are many. Pic by Michael Karrer. Tycho is the lower one in the middle. See what I mean? Supremely cool, but if I carved it at such a distance, it would be a teeny poke mark with some lines coming out. I didn’t have that much real estate; one ring was to be 6mm wide and the other only 4mm. So I looked around at a lot of craters until I found a linear cluster of pretty cool ones. That is generally what is called the South Central Highlands. Smack front and center, and I even got to include Tycho near the end of my crater string. 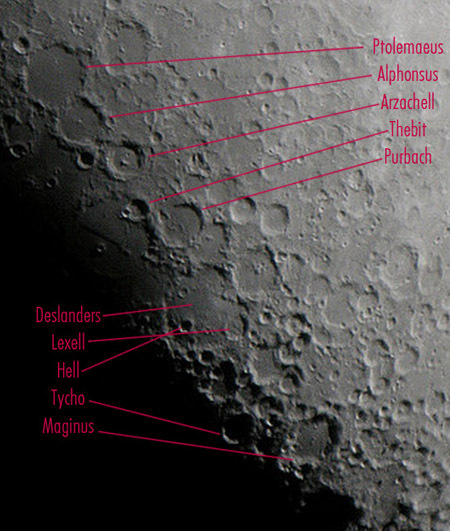 I started, more or less, with the three large craters: Ptolomaeus, Alphonsus, and Arzachel, and ended with Tycho, an edge of Maginus, and Clavius (which doesn’t show up in the above image except as a black shadow). I like this string of craters because they are prominent, right in the middle of the map, and have some really interesting craters and formations. Pic by Michael Karrer. Another pic here. Arzachel is cool, with a nice prominent rim, a mountain, a few baby craters, AND a canyon (rille) in the bottom. It’s named after an Arabic astronomer named Abū Ishāq Ibrāhīm al-Zarqālī. Obviously. Thebit pic by Michael Karrer. I also like Thebit, the double crater just south of Arzachel. The little bud crater hanging off the edge is just called “Thebit A.” I renamed it “Son of Thebit.” It’s too bad I couldn’t include Rupes Recta, that straight line formation to the right of Thebit. Deslandres pic by Torben Bjorn Hansen. Here’s another nice one with major annotation. I was particularly fond of the whole Deslandres area. A large heart-shaped crater-remains with a lot of other little compound craters smacked all around it. The best part is right in the middle is a neat little prominent crater called Hell (!). 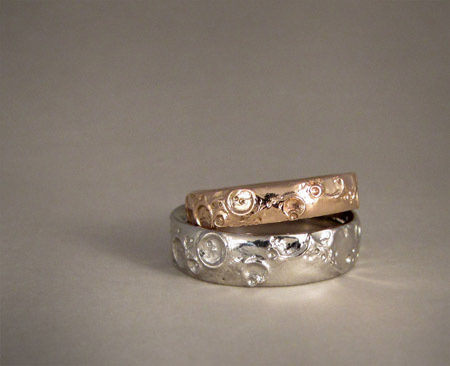 It seemed perfect for a pair of wedding bands. 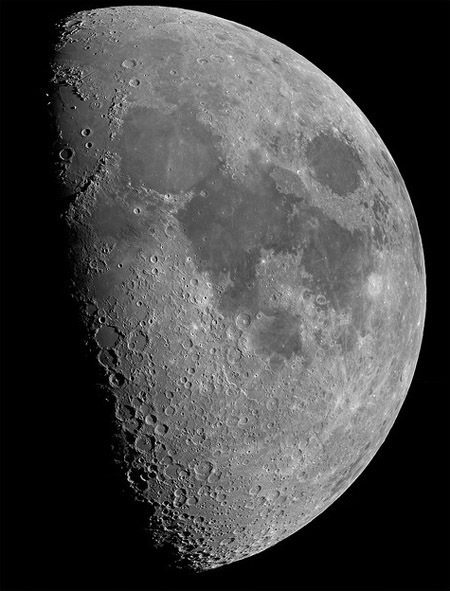 The other cool thing about Deslandres is that the little smooth spot northwest of Hell, called the “bright spot,” is actually one of the brightest spots on the moon visible from the earth during a full moon. You can look up at night and actually see this. If you are looking carefully. Incidentally, Hell Crater is not named for the famed underworld of pop mythology but rather after a Jesuit Priest named Maximilian Hell. Moving along.. Tycho is of course totally rad, no doubt about that. Ultra prominent with its own little mountain in the middle (I wonder what the scale of these features actually is compared to mountains and canyons here on earth). 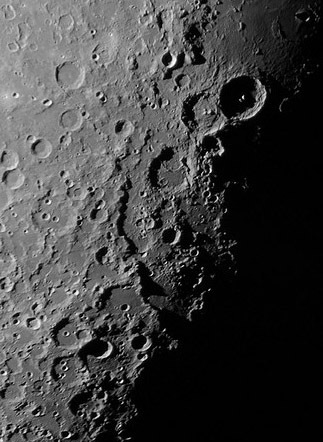 Lastly, we have Clavius, one of the very largest craters on the moon. It’s apparently visible to the naked eye but I haven’t managed to get out there on a good clear 1/2 moon night (pesky Portland weather) to check that. I will though. I feel like these craters are my own personal friends after carving them twice at a 1:2142857 scale. Clavius pic by Michael Karrer. See how cool? 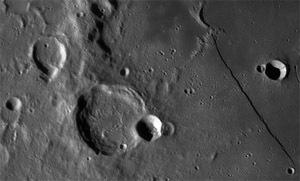 Clavius is also notable for being the location of a fictitious settlement, Clavius Base, in 2001, A Space Odyssey. After all that, here are the rings. 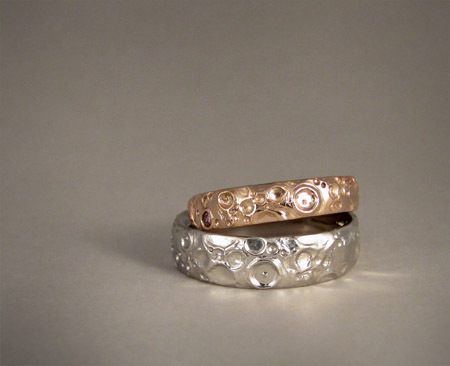 I did his in palladium 950 and hers in 14K rose gold with a little pink champagne-colored diamond set right smack in Hell. 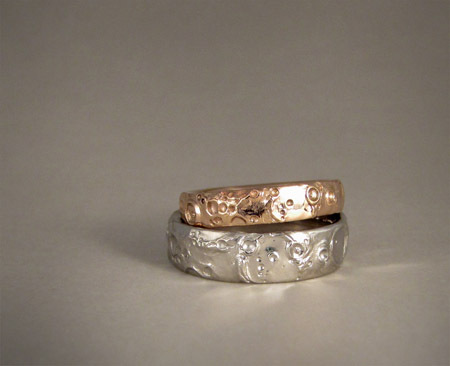 Her ring was essentially a tinier version of his ring and so with the width difference, I was able to simply scale down the ring entirely and not have to trim out much, if any, of the formations. The ring starts out with the three biggies: Ptolomaeus, Alphonsus, and Arzachel. Then Thebit/Son of Thebit and the upper edge of Purbach. You can see the start of the Deslandres area on his ring below. Deslandres, Hell, Lexell. Her ring has a tiny pink/champagne colored diamond set in Hell. Things get a little hectic after Deslandres. 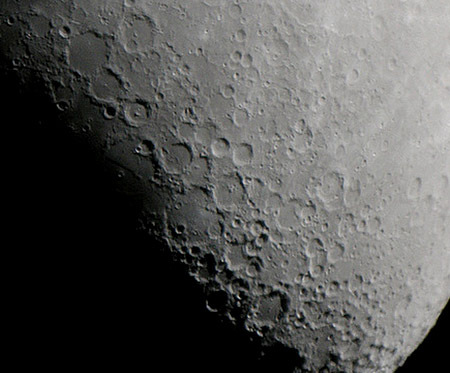 Most prominent is Tycho though, the, um, prominent crater there with the mountain in the middle. 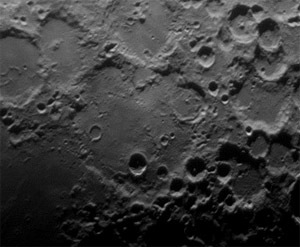 Here’s Clavius. It’s a large flat-bottomed crater with many baby craters smacked all around the edges and inside. On his ring in particular, you can see the lower rim of Maginus to the left of Clavius, at the top edge of the ring. This is the ‘end’ of the design/landscape segment where it comes back around to Ptolomaeus. Just for kicks, here’s a photo of the waxes. Deslandres area, before I tweaked her ring to accommodate the stone. And lastly, I have to thank all of the astronomy buffs out there with the awesome flickr sets. I was able to look at a bunch different photos and angles of each major crater before carving it. I love the internet. I also posted a couple of these pictures without permission (I can’t figure out where I found them in the first place) so if anyone recognizes their image, let me know and I can credit you or remove it, whichever you wish. This entry was posted on Friday, September 2nd, 2011 at 10:42 pm	and is filed under New work, Rings. You can follow any responses to this entry through the RSS 2.0 feed. You can leave a response, or trackback from your own site. 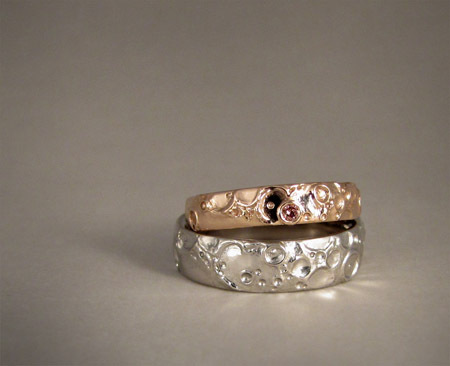 I just wanted to thank you for the exquisite work you did on my daughter and son-in laws rings. The story behind the reason for the moon design is precious to me, but your effortless work and the hard work you did to get the right section of the moon for the design is outstanding. Thank you for giving them a piece of the universe. I will definately make sure that this becomes a part of their love story. 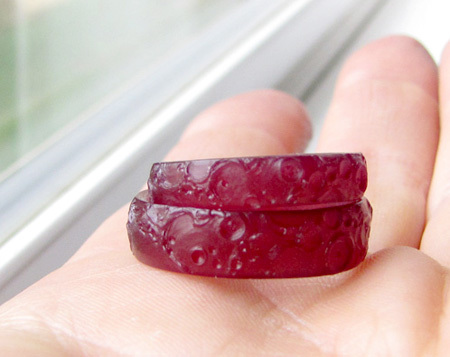 These rings were really fun for me to research and carve and I think they turned out pretty awesome. 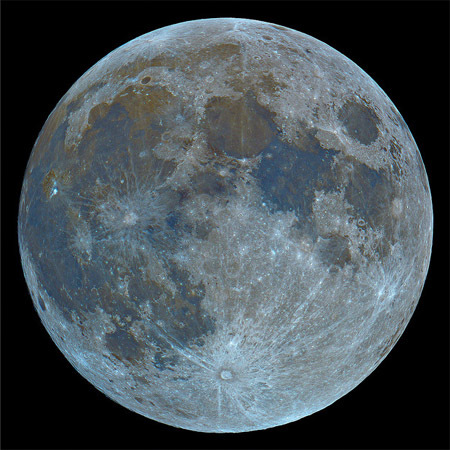 I have never spent much time studying the moon before and it is really so interesting. I dug out this old moon poster we used to have in our apartment years ago but have just been carrying around rolled-up (it’s something like 5′ square) and now I’m on the lookout for a new, un-faded version to put in my daughter’s bedroom. I LOVE your work! amazing! 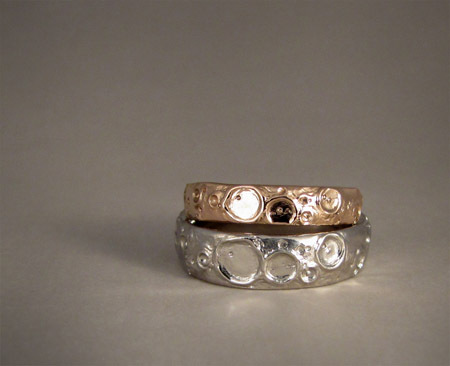 I have so much admiration for what you did with these two rings! “Pop mythology”…LOL. Well said, my friend. Beautiful rings. What a wonderful concept. True art.